As part of our Advent celebration at my church our pastors asked myself and 3 other artists to do a painting for a week of advent. My week was the third week which is focused on Joy. 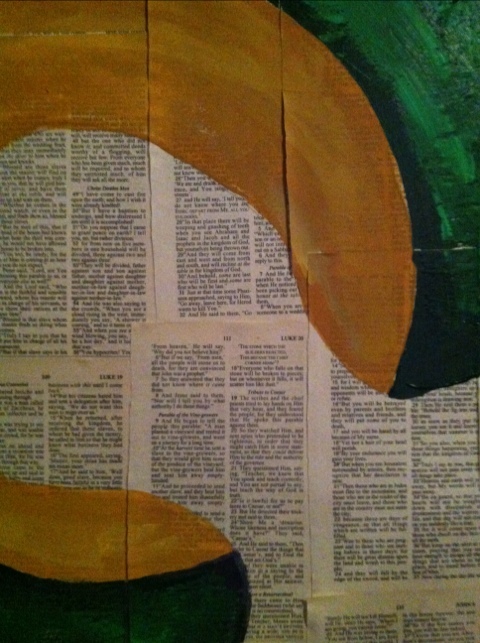 I first covered my canvas with pages from the New Testament. To tell the truth I did feel very strange cutting the pages out of the bible I used. It was a [New Testament & Psalms] paperback that I was handed at some point in college. It was sitting in a box in my basement so I feel that I, in the words of my pastor, “redeemed it.” It was not doing any good in a box. So the pages are all of Matthew, Mark, Luke, and John along with most of the book of Acts. Then I painted the source of the Joy of Advent. The infant Jesus, God incarnate, the Glory of Heaven on Earth with us. 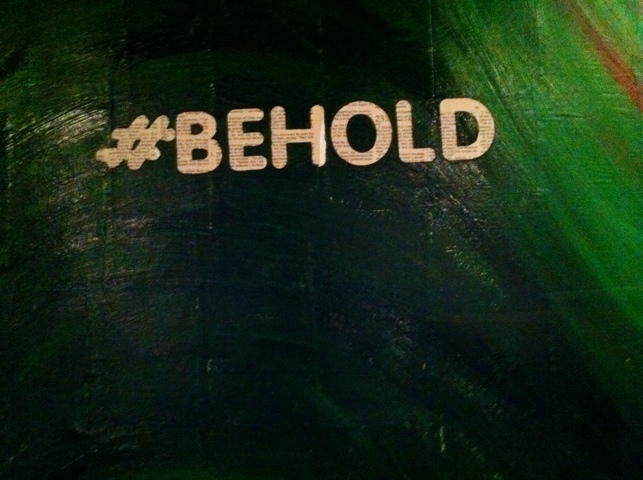 I used #behold because I was reminded that one of the greatest pictures of Joy is when the Angel says to the shepherds, “behold, I bring you good news of great JOY…” You should check out how people on twitter are using the hashtag #behold. 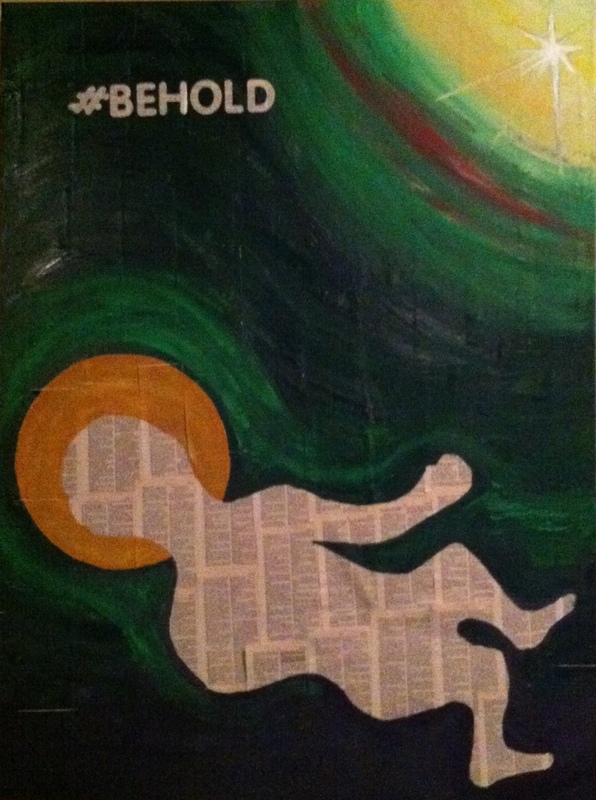 I really enjoyed painting this, I love that my church values visual arts. I have some things to say about the church and art, but I will save that for later. 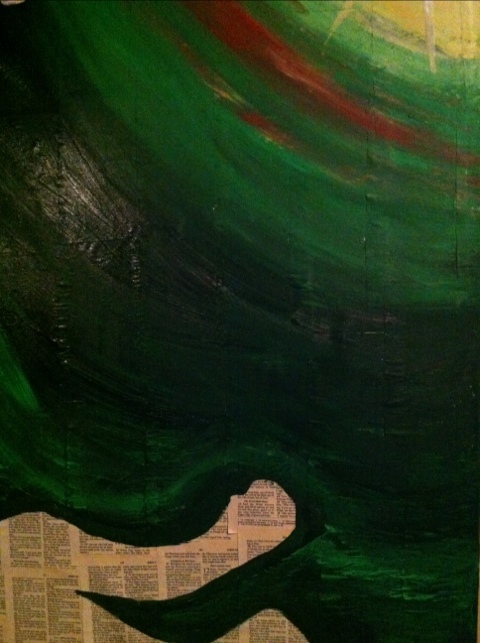 What makes this even cooler for me is that this painting now hangs in the sanctuary at New Beginnings.